Thai food is my favourite cuisine. Whether it’s fresh salads, fortifying noodle soups or spicy curries, every meal has a vast spectrum of explosive flavours to keep your taste buds on their toes. 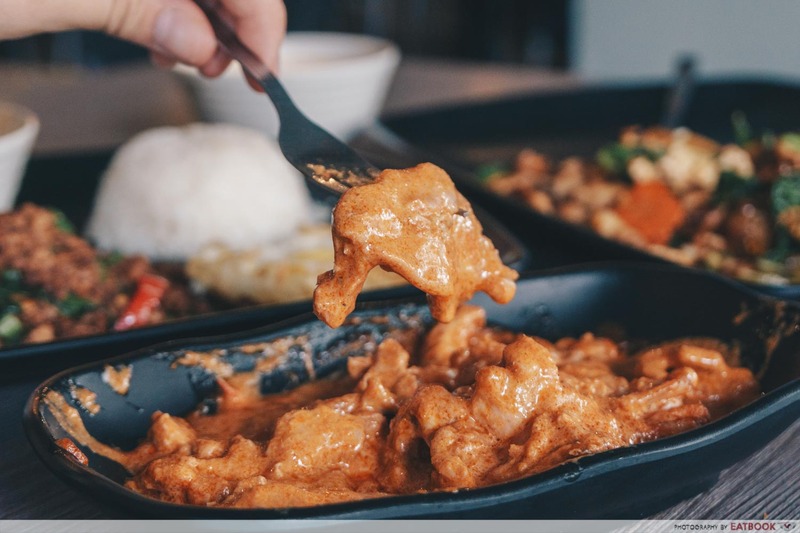 I’m not alone on this, and the rising popularity of this South-East Asian cuisine means that Thai restaurants have become a dime a dozen on our shores. Baan Khun Nai is a new entrant to the competitive scene, and its central location and affordable set meals swayed us to make a trip down. Impressive caramelisation was evident from first glance in our Basil Minced Pork Set ($7.90). A layer of dark brown glaze coated the pebbles of pork and basil leaves, hinting at intense savoury flavours. 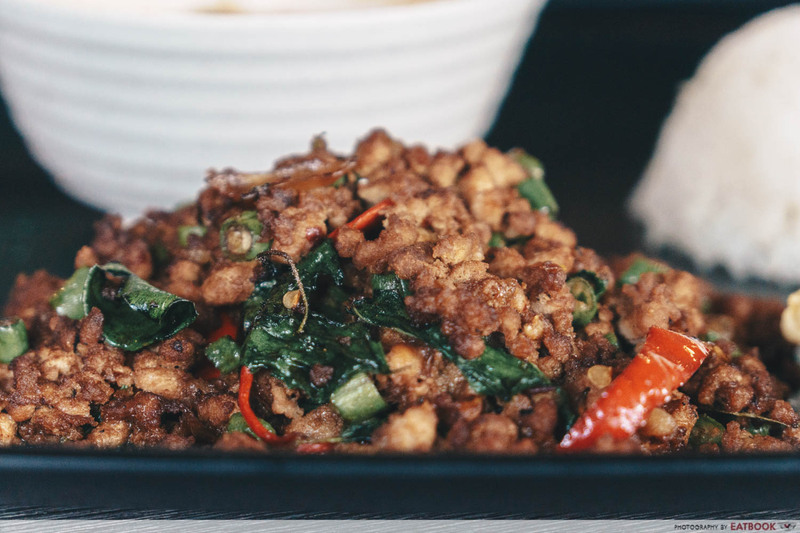 Basil pork or chicken is one of the most common Thai dishes, so we hoped for a version that stood out from the pack. All the standard hallmarks of basil pork were present, with some in greater force than we anticipated. That glossy glaze translated into a potent pang of fish sauce umami and a sweet undertone of caramelised sugars. In isolation, it’s a welcome effect, but it meant that the headlining basil faded into the background. While the herb’s aromatic presence was still felt, we wished it had a touch more influence. 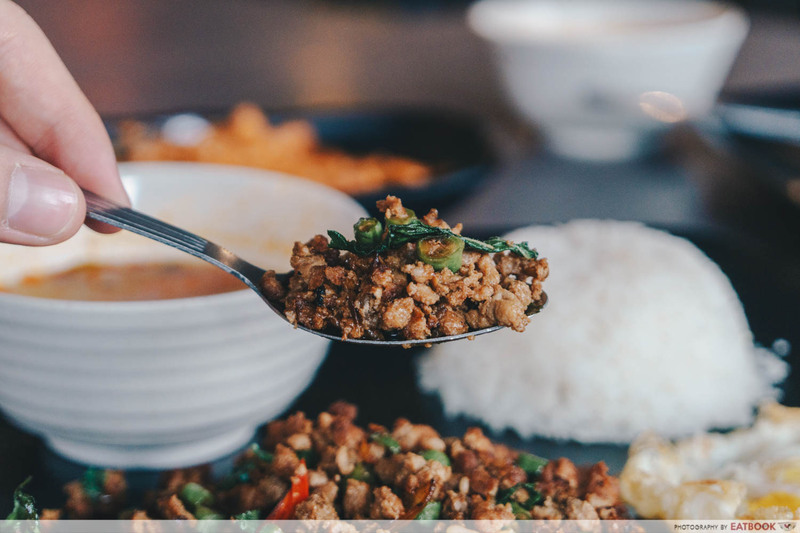 Basil pork is commonly suited for entry-level chilli eaters who want to experience Thai flavours without burning their digestive tract. However, this plate packed a surprising punch. While it wasn’t singe-your-eyebrows-off hot, a tingle of heat constantly lingered on our tongues. The best versions of this dish star have tender globules of pork, but ours were slightly overcooked. While they weren’t unpleasantly tough, more meaty juices would have complemented the robust savoury-sweet flavours. Another minor niggle we had was the absence of jasmine rice. The subtle floral aroma of this Thai staple would have been a valuable counterpoint to the torrent of strong flavours residing in the other components. Every set meal comes with tom yum soup. 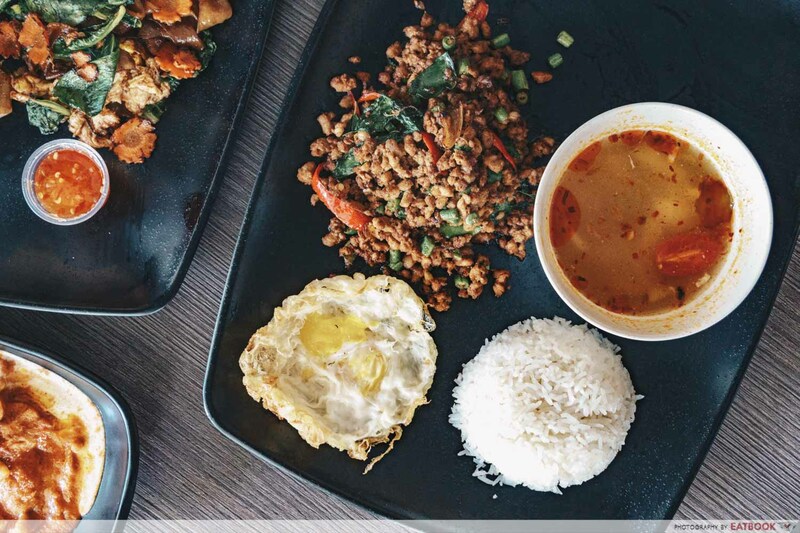 This symbolic Thai dish falls into two camps: clear and milky. Our bowl, however, strangely straddled between the two, appearing slightly cloudy. The peculiarity didn’t end there. 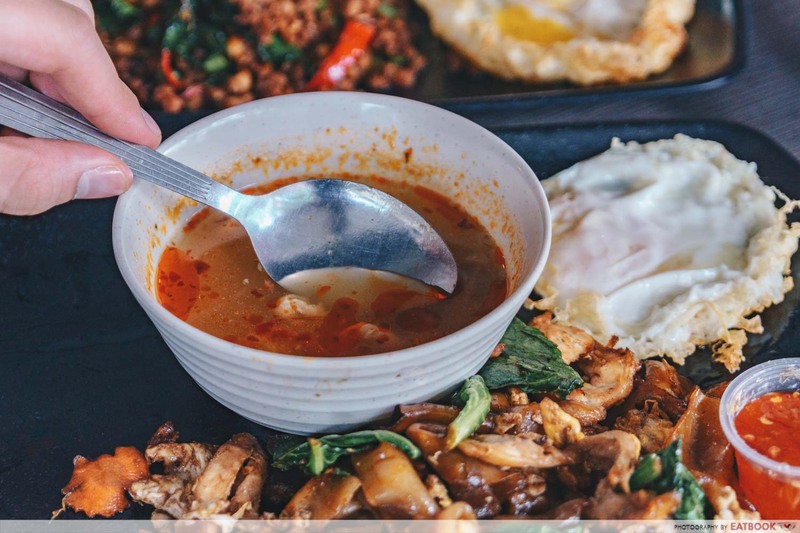 From sour to spicy to sweet, tom yum is beloved for its gamut of flavours. However, this version went overboard on the sour scale, and was more similar to a lime-tamarind broth. It lacked the smoothness of coconut milk, chilli heat, and lemongrass funk to balance that pungent acidity. 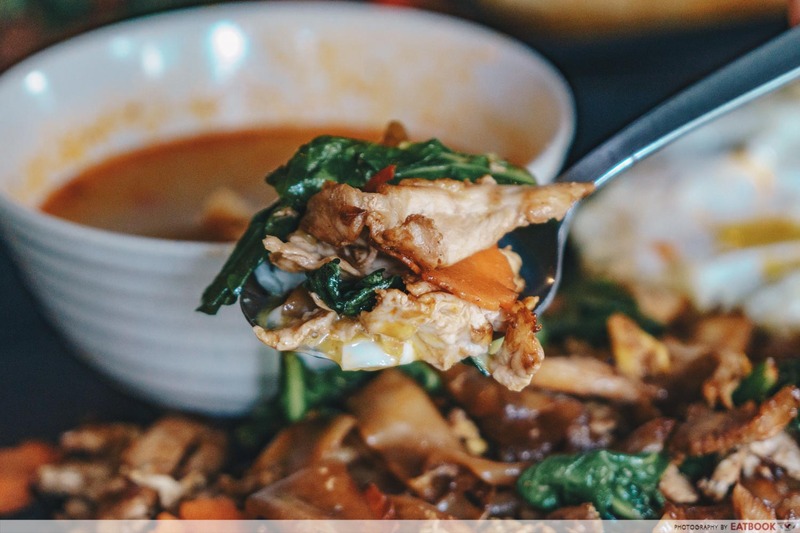 Tom yum is a litmus test for any Thai eatery, and this Novena joint fell short. 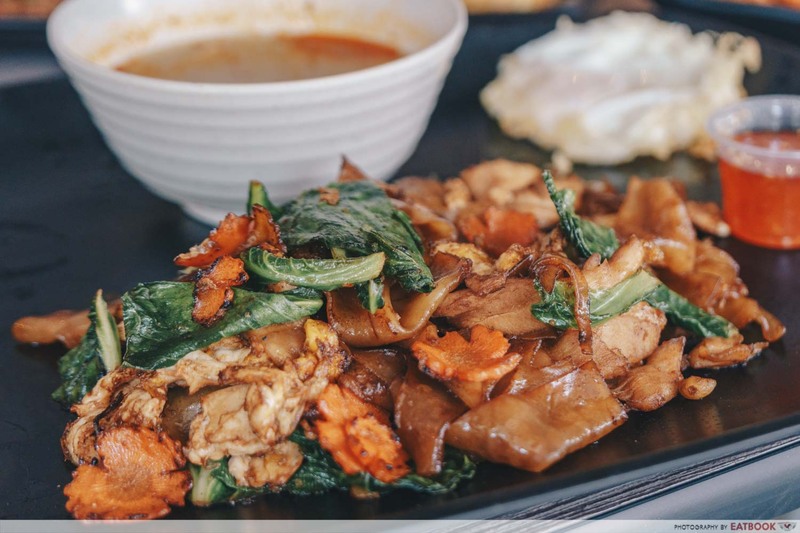 Pad See Ew is the Thai interpretation of char kway teow, commonly seen as hangover food. Thus, we hoped for assertive flavours in our Pad See Ew Set ($7.90), robust enough to clear a roaring headache. Similar to its piggy relative, alluring caramelisation was evident on our noodles and carrot flowers. Pad see ew customarily has a pale brown complexion, but the Maillard reaction rendered these kway teow a darker shade. The usual fish sauce savouriness was also kept to a minimal, with breaths of smoky wok hei and zingy garlic wafting over our palates instead. A range of varied textures also kept things interesting for our senses. 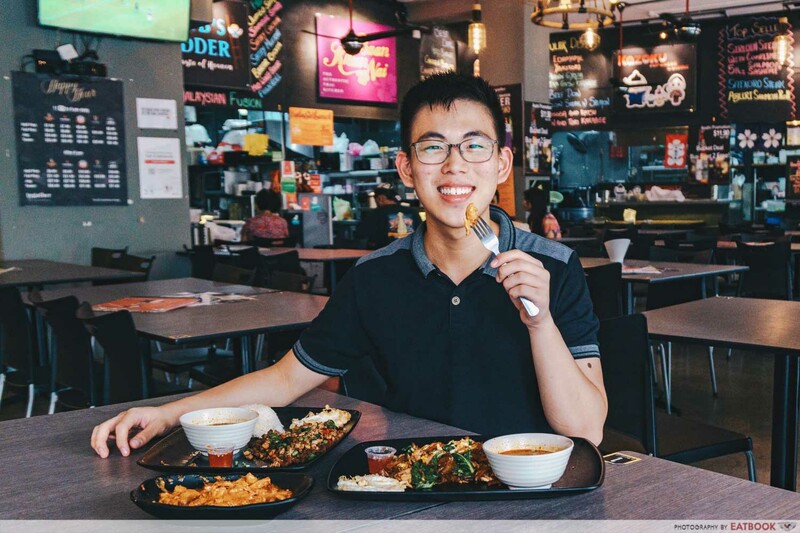 The smooth, elastic kway teow was juxtaposed with crunchy torpedos of kai lan and carrots, rough chunks of minced pork and a fried sunny side up. These noodles are nothing fancy. But returning to its origin as a hangover cure, I could certainly see myself eating this after a night of drinking, only to be perked up by its strong yet balanced flavours. 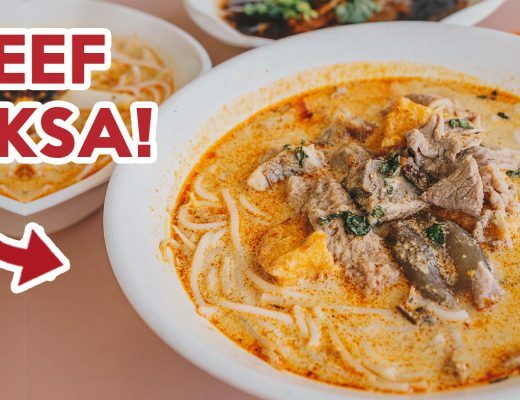 Singaporeans are well-acquainted with soupy and coconutty green curry. 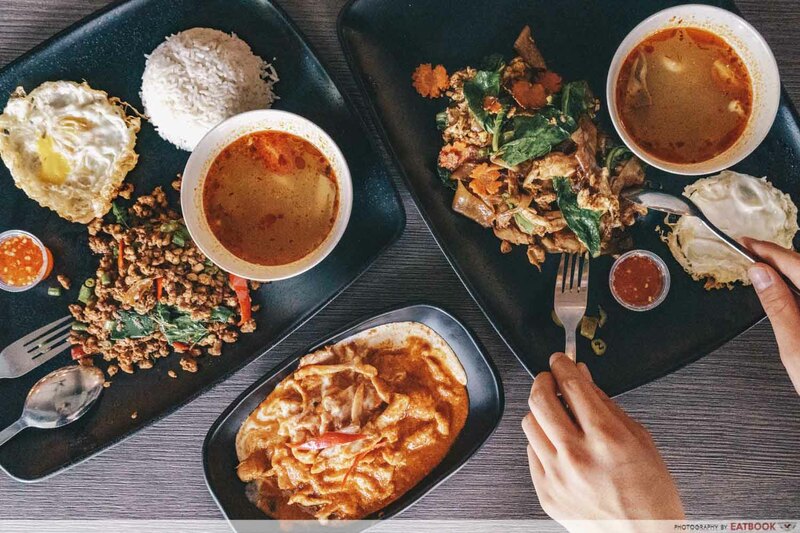 Thai cuisine is actually home to an array of other spicy gravies though, with red, yellow and Massaman curry being some other notable club members. Each has a different consistency and flavour profile that’s just as attractive as their famous green brother. 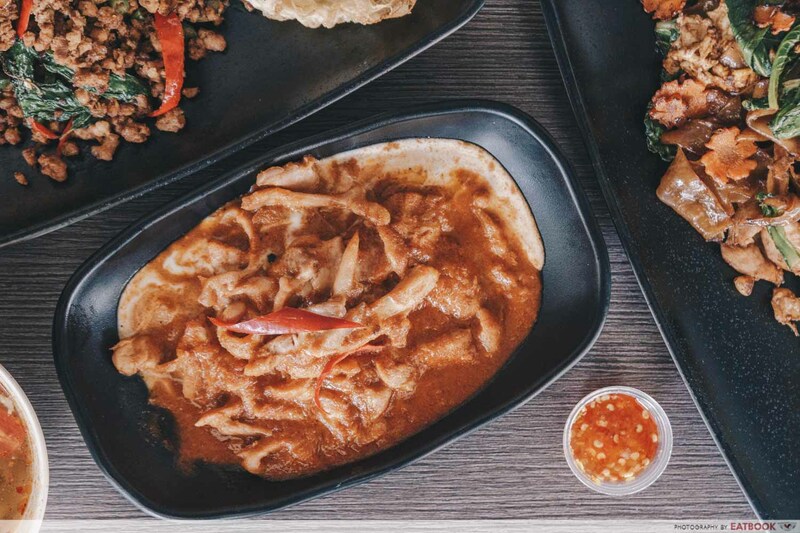 Our Dry Curry Chicken ($7.90) delved into the realm of red curry. 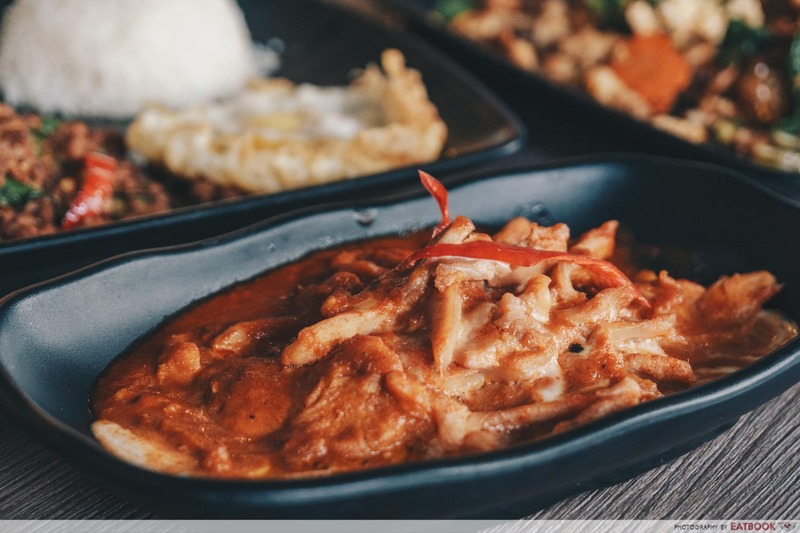 This breed of curry is thicker, with a consistency akin to rough, gloopy sambal. It also dials back on sweetness in exchange for deeper, earthier notes, making it a heavier dish overall compared to its green friend. Like a pint of Ben & Jerry’s ice-cream, a swirl of coconut milk ran along the side of our silky curry. That signalled the flood of coconut that enveloped our mouths from first spoon, shining more prominently than the curry powder. This coconut flavour transitioned to salty and spicy curry for an explosive and complex mouthful. These strong flavours are a double-edged sword. As we continued munching on our tender, curry-drenched chicken chunks, the deluge of coconut, salt and spice gradually became overbearing. 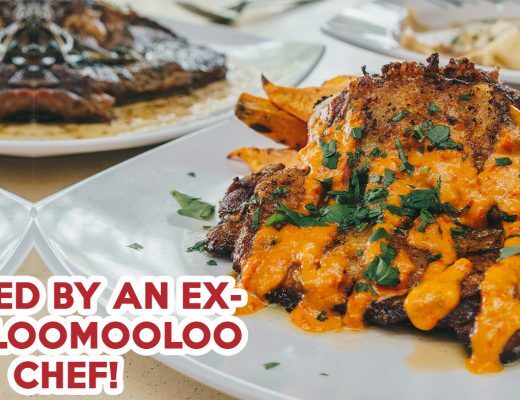 It’s certainly not a plate we would be able to finish by ourselves, so have it to share in a group. A possible solution would be scaling back on creamy coconut milk and salt in exchange for a stronger dose of curry powder. On that spicy front, this rendition was lighter than versions I’ve tasted in Thailand, which seem to be rougher in texture with a greater proportion of spices. 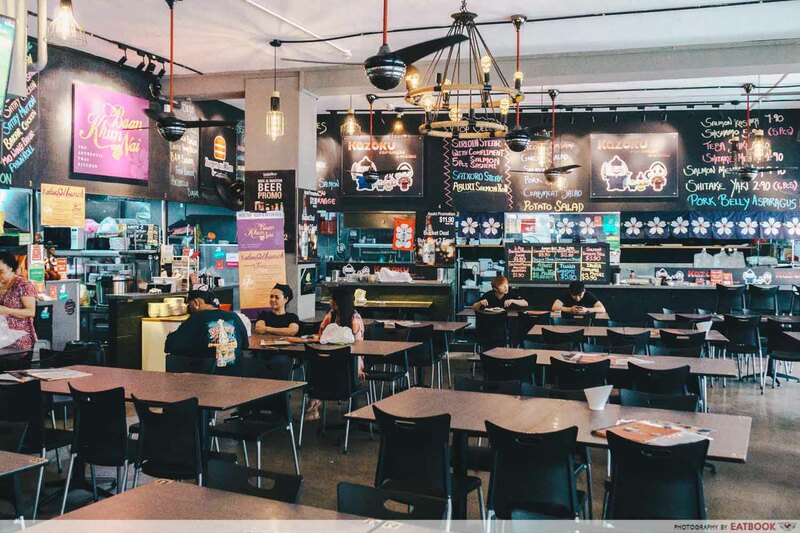 A short walk from Novena MRT Station, this stall is part of a coffee shop-style space in Goldhill Plaza. 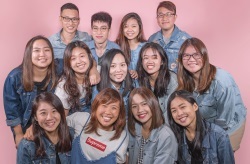 It’s also a stone’s throw from United Square – a frequent childhood hangout for many millennials, so let nostalgia wash over you while exploring the area. There’s a unified counter to order your food, so you can accompany your Thai dishes with some donburi or a jug of refreshing ale. Their storefront is bedecked in purple and yellow livery that echoes Thai Airways colours, making them stand out amongst the other stalls. Baan Khun Nai serves up solid Thai food, in a convenient central location, for relatively cheap prices. It checks the boxes for flavour, accessibility and affordability, but not convincingly enough for us to make another trip down. 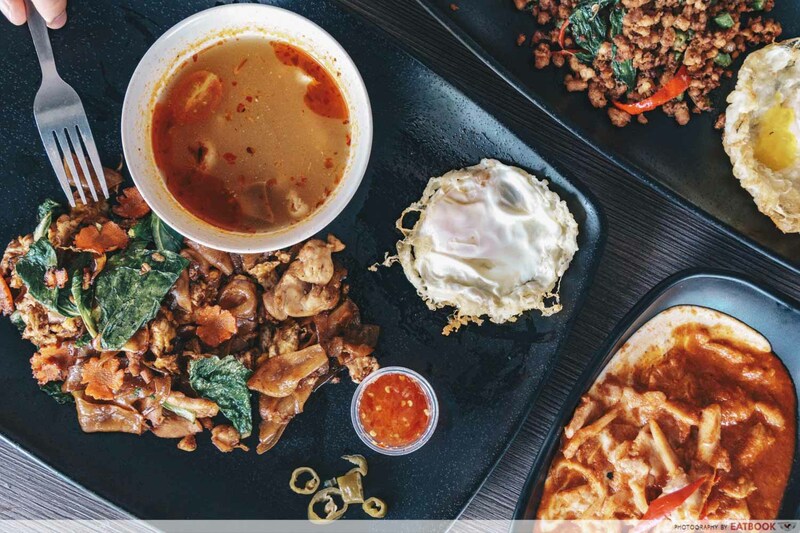 The market for Thai food in Singapore is congested, and any new challenger needs to excel to achieve recognition. However, if you’re in the area and craving for some piquant Thai flavours, this is a good spot to head. 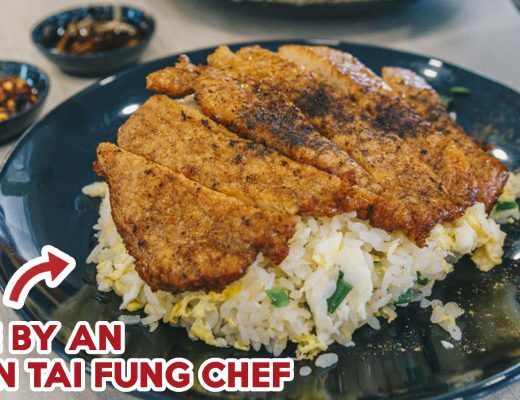 If you’re like us and can’t get enough of those addictively sour and spicy Thai flavours, check out our reviews of Im Thai Kitchen and Basil & Mint, or our list of affordable Thai eateries with mains under $10. 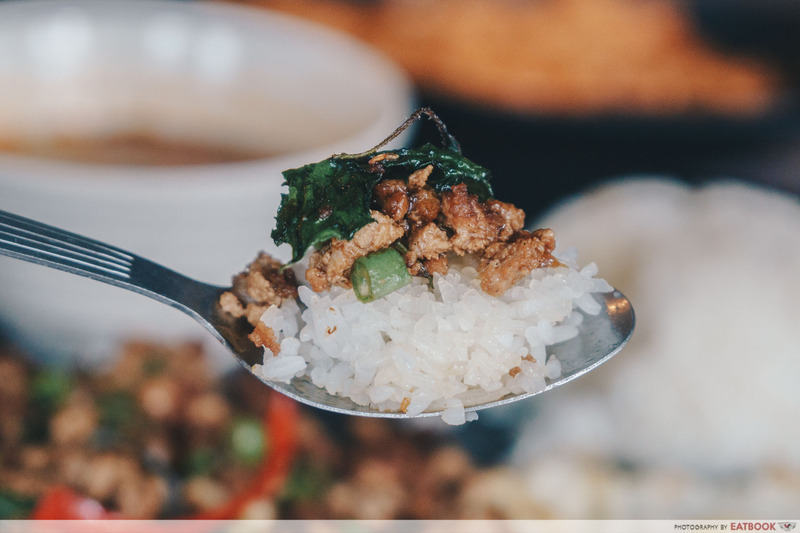 Let us know your favourite Thai restaurants in the comments below! Photos taken by Crystal Tan.